LEAGUE ONE CLUBS GUIDE: Who’s going up? Who’s going down? Where will Peterborough United finish? 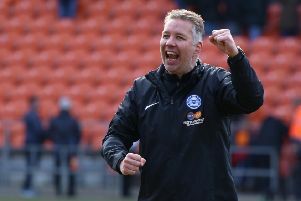 Former Posh boss Darren Ferguson celebrating promotion with Doncaster last season. The Peterborough Telegraph have predicted the last two winners of League One. Can we make it a hat-trick? Bradley Dack (right) has moved from Gillingham to Blackburn. Signings: Dejie Oshilaja (Cardiff), Kwesi Appiah (Crystal Palace), Cody McDonald (Gillingham), George Long (Sheffield United). Jimmy Abdou (Millwall), Liam Trotter (Bolton). Prediction: Some good signings should ensure the Wombles stay above ground. Signings: Peter Whittingham (Cardiff), Richie Smallwood (Rotherham), Bradley Dack (Gillingham), Ben Gladwin (QPR), Paul Caddis (Birmingham), Paul Caddis (Birmingham), Jayson Leutweiler (Shrewsbury). Prediction: Rovers have a great chance of an immediate return to the Championship, as long as Dack is back to his best. Former Posh striker Nicky Ajose is one of many summer signings made by Bury. Signings: Curtis Tilt (Wrexham), Peter Hartley (Bristol Rovers), Ollie Turton (Crewe), Max Clayton (Bolton), Nick Anderton (Barrow), Jimmy Ryan (Fleetwood), Callum Cooke (Middlesbrough), Ryan Allsop (Bournemouth), Christoffer Mafoumbi (Free State Stars), Viv Solomon-Otabor (Birmingham), Sean Longstaff (Newcastle). Prediction: Great effort to get back up, but this squad is more threadbare than the hotel I used up there last season. Jermaine Beckford is now at Bury. Signings: Adam Chicksen (Charlton), Paul Taylor (Posh), Shay McCartan (Accrington), Dominic Poleon (AFC Wimbledon), Alex Gillead (Newcastle), Jake Reeves (AFC Wimbledon). Prediction: Their long pursuit of Nichols suggests ambitions are limited. Just as well really. Signings: Jay O’Shea (Chesterfield), Eoghan O’Connell (Celtic), Joe Skarz (Oxford), Adam Thompson (Southend), Callum Reilly (Burton), Stephen Dawson (Scunthorpe), Phil Edwards (Burton), Jermaine Beckford (Preston), Joe Murphy (Huddersfield), Chris Humphrey (Hibs), Tom Heardman (Newcastle), Tom Aldred (Blackpool), Nicky Ajose (Charlton), Chris Maguire (Oxford), Chris Sang (Wigan). Prediction: There’s a bigger cast list at Gigg Lane than in the Zulu film. If Beckford stays fit he could fire a promotion push at long odds. Signings: Billy Clarke (Bradford City), Mark Marshall (Bradford City), Tariqe Fosu (Reading), Jay Dasilva (Chelsea), Ben Reeves (MK Dons). Prediction: I’ve always enjoyed listening to Karl Robinson after a match, but he’ll be the manager most under pressure if his club starts slowly. Still not a Happy Valley so can’t see a promotion push this season. Signings: Danny Andrew (Grimsby), Niall Mason (Aston Villa), Alex Kiwomya (Chelsea), Ben Whiteman (Sheffield United), Issam Ben Khemis (Lorient), Rodney Kongolo (Manchester City). Prediction: Have a manager who knows how to win back-to-back promotions but squad not good enough. Signings: Kyle Dempsey (Huddersfield), Harvey Rodgers (Hull), Conor McAleny (Everton), Connor Ogilvie (Spurs), Jordy Hiwula (Huddersfield), Lewis Coyle (Leeds), Aiden O’Neill (Burnley). Prediction: The Cod Army probably pushed the boat out to keep Rosler on board. Feel they over-achieved last season though. Signings: Gaby Zakuani (Northampton), Luke O’Neill (Southend), Alex Lacey (Yeovil), Tom Eaves (Yeovil), Conor Wilkinson (Bolton), Billy Bingham (Crewe), Liam Nash (Maldon & Tiptree). Prediction: The Gills will be in deep water this season and I don’t see them surviving. Signings: Conor McGrandles (Norwich), Ousseynou Cissé (Tours), Wieger Sietsma (Heerenveen), Ethan Ebanks-Landell (MK Dons),Gboly AriyibiGboly Ariyibi (Nottingham Forest), Aaron TshibolaAaron Tshibola (Aston Villa), Ryan Seager (Southampton). Prediction: Their struggles were a mystery last season, albeit a very amusing one. They could be the ones laughing this time around. Signings: Billy Waters (Cheltenham), Leon Barnett (Bury), Sam Foley (Port Vale), George Smith (Gateshead), Daniel Powell (MK Dons), Leon Lobjoit (Buckingham), Dean Bowditch (MK Dons), Regan Poole (Man Utd), Ash Taylor (Aberdeen), Yasir Kasim (Swindon), Matt Crooks (Rangers), Aaron Pierre (Wycombe), Chris Long (Burnley). Prediction: I was ready to condemn the Cobblers this season, but then they enjoyed a Chinese takeaway at boardroom level. Jammy devils. Signings: Dan Gardner (Chesterfield), Craig Davies (Scunthorpe), Rob Hunt (Brighton), Courtney Duffus (Everton). Prediction: More boring to watch than Alastair Cook. It usually helps them escape trouble though. Signings: Charlie Raglan (Chesterfield), Scott Shearer (Mansfield), Fiacre Kelleher (Celtic), James Henry (Wolves), Jonathan Obika (Swindon), Dwight Tiendelli (Swansea), Xemi (Barcelona B), Michael Williamson (Wolves), Jake Payne (Huddersfield), Ricardinho (Gabala). Prediction: Signed a four-letter player from Barcelona whose surname begins with an X. This X stands for anonymity and a mid-table finish. Signings: Ryan Edwards (Morecambe), Ruben Lamieras (Coventry), Lionel Ainsworth (Motherwell), Gregg Wylde (Millwall), Robbert te Loeke (Achilles ‘29), Joel Grant (Exeter), Aaron Taylor-Sinclair (Doncaster). Prediction: Will have good momentum from last season. Green army could be going forward again. Certainly won’t struggle against relegation. Prediction: Wouldn’t back them at these odds, but this remains a big club for League One and they have a manager with a great track record at the level as well as the best goalkeeper in the division. Signings: Josh Tibbetts (Birmingham), Danny Lloyd (Stockport), Ricky Miller (Dover), Jack Marriott (Luton), Jonathan Bond (Reading), Michael Doughty (QPR), Liam Shephard (Swansea), Alex Penney (Nuneaton), Steven Taylor (Ipswich), Idris Kanu (Aldershot). Signings: Brendan Moore (Torquay), Jordan Williams (Barrow), Reece Brown (Bury), Brad Inman (Posh), Kgosi Nthlhe (Stevenage), Matt Done (Sheffield United). Prediction: Continue to surprise every season. They’ll miss Mendez-Laing which is a sentence I never thought I’d write. Signings: Darren Potter (MK Dons), Michael Ihiekwe (Tranmere), Ryan Williams (Barnsley), David Ball (Fleetwood), Josh Emmanuel (Ipswich), Kieffer Moore (Ipswich), Jamie Proctor (Bolton). Prediction: Can’t see Millers grinding out results to reach play-offs. Signings: Cameron Burgess (Fulham), Matt Gilks (Wigan), Rory McArdle (Bradford C), Funso Ojo (Willem II), Devonte Redmond (Man Utd). Prediction: Rumoured to be offering big money, if so they haven’t spent it that wisely so far. Last season’s late collapse might still be haunting them. Signings: Jon Nolan (Chesterfield), Lenell John-Lewis (Newport), Arthur Gnahoua (Kidderminster), Ebou Adams (Norwich), Zak Jules (Reading), Daniel James (Swansea), Carlton Morris (Norwich), Craig MacGillivray (Walsall), Niall Ennis (Wolves), James Bolton (Gateshead). Prediction: There’s a reason bookmakers drive big cars and live in flash houses. They know which teams are going down. Signings: Stephen Hendrie (West Ham), Michael Turner (Norwich), Michael Kightly (Burnley), Rob Kiernan (Rangers), Amadou Ba (Le Havre). Prediction: Strong and powerful last season and added a couple of decent players. Manager Phil Brown could be glowing come May, and not just because of his sunbed sessions. Signings: Luke Leahy (Falkirk), Jon Guthrie (Crewe), Mark Gillespie (Carlisle), Nicky Devlin (Ayr), James Wilson (Sheffield United). Prediction: Even the Wizard of Oztumer won’t save the Saddlers. Indeed Harry Potter, Merlin and Paul Daniels wouldn’t have enough magic to help them. Signings: Chey Dunkley (Oxford), Terrell Thomas (Charlton), Christian Walton (Brighton), Gavin Massey (Orient), Callum Elder (Leicester), Noel Hunt (Portsmouth), Ivan Toney (Newcastle). Prediction: No parachute payments this time around, but still wealthy compared to most in League One and money usually talks. Rating Guide: ***** Champions; **** Strong promotion contenders; *** Mid-table obscurity; ** Relegation candidates; * Doomed.